Lorraine Paton: Alberta - Wow, look at the size of that... bridge! Alberta - Wow, look at the size of that... bridge! Since buying our travel trailer a few years ago, we have done a lot of camping or, as my hubby prefers to think of it, RVing throughout Alberta. A couple of years ago, we went to southern part of the province, which is known for its wind. The huge armies of wind turbines in the area is evidence of this gusty reputation (so it isn't just my own opinion). That weekend, we stayed in a little campground with half-dead trees the width of broom handles. These little sticks did nothing to slow the wind before it slammed into our trailer. Thankfully, though, when we went sightseeing, the wind let up. Yay! The highlight of the trip was the bridge in Lethbridge. Sure, I’d seen that bridge every time I’d been to Lethbridge – and, over the course of my life time, that was a lot - but I can’t remember the last time I went down to the base of the bridge to Indian Battle Park and looked up at it. Like that scene in Dead Poets Society when they stand on their desks… sometimes you need to experience familiar things from a new perspective. No one is allowed to walk on the bridge, but I wonder what it'd be like to stand in the middle, on the top and look down... Then again, I think I could give myself vertigo just imagining it. 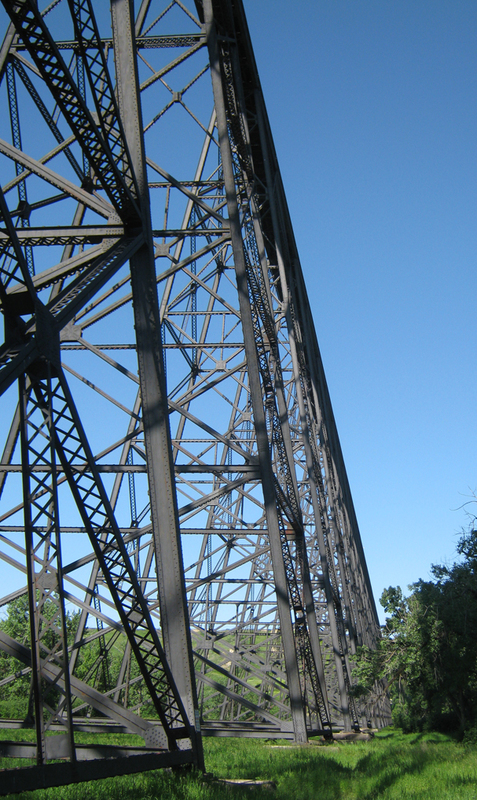 The High Level Bridge (aka the Lethbridge Viaduct), which opened in 1909, is beautiful. It is a steel trestle over the wide coulee of the Oldman River. The structure is over 1.6 kilometers (1 mile) long and just shy of 100 meters (314 feet) high. They say it is the largest railway bridge in Canada… maybe the world. 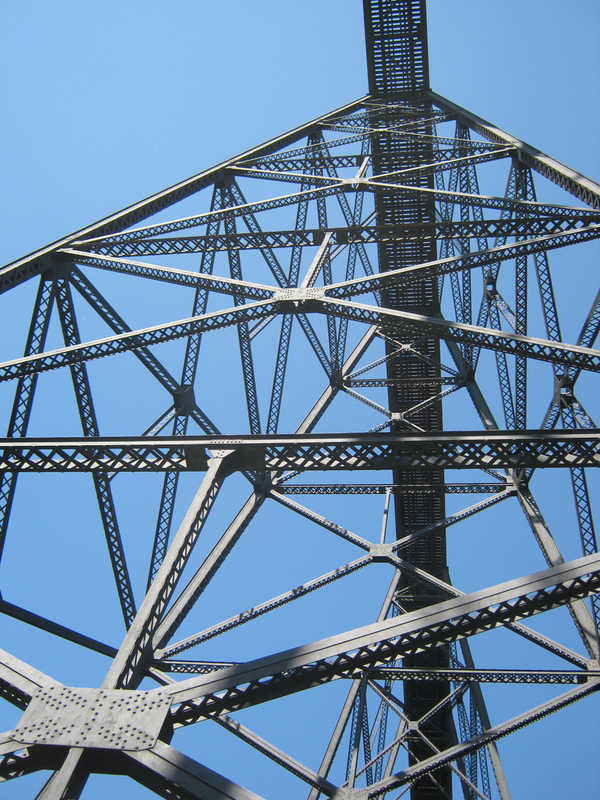 The bridge is a striking piece of history, engineering and industrialization. 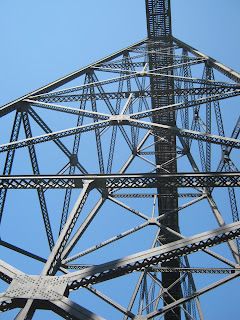 The metal work appears lacy and delicate against the blue sky, when you stand at the base there is no mistaking the enduring strength of the structure. What a great old bridge! It's imposing. And you are so right about seeing things from a different perspective and how that changes the way you look at them. We have some old trestle bridges in my area. One, however, was destroyed a number of years ago by weather. We had the blizzard of '96 followed by the thaw of '96. Snow and ice floated down the Susquehanna River in our capital city of Harrisburg and hit one of the trestle bridges. It buckled under the force and got swept away in the river. My brother was in Florida at the time. He said he was walking by a shop with a TV set in the window where a bunch of people had gathered. He stopped to see what the fuss was and saw the Walnut Street bridge on World News being swept away by flood waters. Had to be surreal for him down in Florida! It must have been strange to see "home" on a on the news in another state! Too bad that the flood took out a bit of history, though. Isn't it amazing how powerful nature is? I was on site a few years ago, looking at flood damaged areas. And, there was a huge beast of a bridge that had been swept about a mile down the river, then got into a big grove of trees at the bend. It took a lot of effort and ingenuity to get the bridge back to where it belonged!